Early Christians focused on the death and resurrection of Jesus Christ and, to this day, remember saints by the day they died (and rose to sainthood), not by the day they were born or any other day. When a birthday celebration for Jesus finally got started and then moved into Europe, it encountered and eventually mingled with already well-established traditions like Saturnalia and Yule. Jesus Christ was not born on 25 December - nobody really knows when exactly he was born, we only know the year and not even that with complete confidence. The Bible doesn’t give us enough clues and historical sources give a number of possible days of birth, but nothing is certain. Combined with the early Christians’ opinion on birthdays, Jesus’s birthday was not really celebrated for the first few centuries after Jesus was born. Kalends, another few days celebration that started on New Year’s Eve. Christmas, as celebrated right in the middle of 3 important Roman winter celebrations and during Northern winter festivals, was started to compete with them and all other pagan religions with winter celebrations. The main purpose was to attract more pagans to Christianity, pagans who wouldn’t otherwise give up their favorite celebrations, and to give the festivities a more spiritual meaning (plus make them less excess-prone and sinful). The latter didn’t quite work - to this day many Christians are not happy that the spiritual side of Christmas is overshadowed by other elements of winter festivities. „The decision was part of what amounted to a compromise, and a compromise for which the Church paid a high price. Late-December festivities were deeply rooted in popular culture, both in observance of the winter solstice and in celebration of the one brief period of leisure and plenty in the agricultural year. In return for ensuring massive observance of the anniversary of the Savior’s birth by assigning it to this resonant date, the Church for its part tacitly agreed to allow the holiday to be celebrated more or less the way it had always been. During the Protestant Reformation of the 1500s, a group of people broke from the Roman Catholic Church thinking the religion strayed too far from the biblical model - they weren’t ok with venerating saints, having bishops, holding elaborate ceremonies or observing holy days. These were the Puritans. Christmas became a target for the Puritans because “it had no biblical warrant, was not practiced in the early church, and was rooted in pagan superstitions” – plus it was celebrated in ways they saw as immoral (drinking, gluttonous eating, cursing etc). Considering what we learned so far, fair points. Outlawing Christmas was something that even Puritan supporters didn’t approve of and it lead to street riots in various English towns while Puritans bullied worshippers at Christmas Day services and people who closed their businesses on Christmas Day. 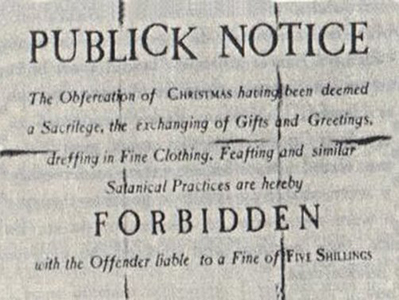 It carried into the American colonies where people only celebrated Christmas here and there - Christmas observance was even outlawed in Boston in 1659. The repression made people kind of forget about Christmas in both England and the USA for a few centuries. A bit of context: it all starts with Saint Nicholas. There are few actual facts known about him, basically the general time period he lived in (the 4th century) and his location (bishop of Myra, in what is now Turkey). Despite not knowing much about the actual man, his name is drowned in legends and he became one of the most beloved saints in Europe. One peculiar story says that, as an infant, Saint Nicholas demonstrated his holiness by refusing to breastfeed on Wednesdays and Fridays, because these were the traditional days of fasting. A legend was formed in the Netherlands: Sinter Klaas, as the Dutch called Saint Nicholas , dressed as a medieval bishop and rode a white horse over the rooftops on the eve of December 6, leaving small gifts in shoes children had placed on the step or by the fireplace (or a bunch of twigs for the bad kids). In the 1500s when the Protestant Reformation took place, the Protestants (who were against priests, bishops and saints as mediators between the people and God) wanted to eliminate Saint Nicholas Day and all that it encompassed. Protestants in Germany proposed to replace Saint Nicholas with the Christ child (a spiritual, religious context) who would bring gifts to children (to keep the kids happy) and move the celebration to Christmas Eve. The people complained that the gift giving overwhelmed the spiritual meaning of Christmas and the children were not at all enthusiastic about a child bringing gifts, as opposed to a merry bearded old man. Plus it lead to the apparition of bastardized versions of Saint Nicholas, numerous new companions, blending of both characters etc. that bothered the Protestants even more. Both celebrations suffered various changes over time and have been both celebrated in Europe and in various Catholic countries ever since. An urban legend making the rounds on the internet says that Coca Cola created Santa Claus – that’s one tiny part of the truth. The truth is Santa Claus was created like a puzzle piece: starting with the legends of Saint Nicholas bringing gifts to children, a number of people from the start of the 1800s added pieces to the puzzle until Coca Cola placed the last pieces that formed the Santa Claus that we know today. Charles W. Jones wrote, "Without Irving there would be no Santa Claus”. Irving , called “the first internationally known American author”, wrote the satirical „A History of New York” and published it on Saint Nicholas’ Day 1809 - it contained 25 references to Saint Nicholas, describing the importance of the Saint in the lives of the residents of New Amsterdam as well as some other „facts”, now known to be complete fiction. Nonetheless, he made Saint Nicholas Day popular and by 1835, Washington Irving and others founded the Saint Nicholas Society of New York City. Clement Moore or Henry Livingston Jr.
Authorship is uncertain and still debated to this day, but one of them has written the famous and influential poem “The Night Before Christmas,” first published anonymously in the Troy, New York, Sentinel in 1923. It reshaped Saint Nicholas (still keeping him as Saint Nicholas, not Santa Claus) and Saint Nicholas Day to a form more similar to today’s Santa Claus and Christmas. The poem was embraced by the public, it launched a phenomenon and is regarded as the most important puzzle piece for the creation of Santa Claus and Christmas as we know it. Nast was a prominent cartoonist and illustrator who worked as head catoonist at Harper’s Weekly for thirty years and who imagined and created numerous illustrations of Santa Claus, expanding the lore surrounding him. 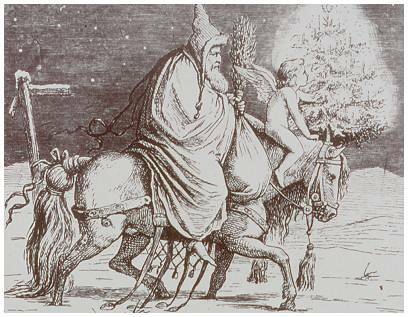 He is responsible for the image of Santa as a toymaker, for the appearance of elves as assistants, for Santa receiving letters from children and others. Last, but not least, is the illustrator who created the Cola Cola ads and added the last piece to the Santa Claus puzzle in the 1940s. With the Coca Cola ads, Santa Claus’s popularity exploded. On the way here, Saint Nicholas turned into Santa Claus, he started being celebrated on 25 December instead of 6 December and the lore changed around the giving of gifts to children. And thus Christmas as the celebration of the birth of Jesus Christ and the tradition of Santa Claus bringing gifts to children blended together creating the Christmas that we know today. And they say Valentine's day is an invented holiday. But who cares, we say let's celebrate anything and everything, as long as it brings something positive in our lives!